How to Choose a Right Handsfree Phone Headset ? Various types of headsets compete on the store shelves for your attention. It can sometimes be really hard to pick out the right headset when there are so many to choose from. When you are interested in buying a new headset you should firstly consider what sort of style you want to get. Is it one with a headband like the Plantronics M214C? Perhaps you’d be interested in the Samsung HM1300 that hooks on your ear? Maybe you want one that you can attach to a 3.5mm universal jack into the phones place for minijacks? If you do it like this you will continuously be hooked up to your telephone with a wire. If so the ReTrak might be a good choice for you. A different choice might be a headset that resembles the Earbud Headset that attaches to your shirt? You need to consider how comfortable the headset is because if it’s not nice to wear then you most likely won’t actually end up using it. If it’s uncomfortable it will end up in a drawer somewhere. So what do you want to get out of using your hands free headsets? The Plantronics M214C headset has a design that can go over your head that you can easily adjust, control the volume and utilizes a wire to attach to a phone 2.5 mm minijack. If you own a phone that needs a 3.5 mm jack like the iPhone 5s then you will have to get some sort of adapter. The bad thing about this is that it will add to the weight and size of this product and will need more cash in order to buy the adapter. That being said it has the ability to use a noise canceling feature. Instead of having to worry about charging it, you’ll just need to keep your cellphone charged. Occasionally phones like the Samsung HM1300 have the tech to cancel noise inside the phone. Other phones like the Earbud Headset will make a sound to give you a reminder if you forget your phone and makes a sound when you have calls coming in. These both have a standby time of 300/240 hours and the ability to talk for 8/7 hours. Also, they both weigh less than an ounce with the Samsung HM1300 just having the weight a bit less than the Earbud Headset. This weight doesn’t even matter, especially since the other is made to attach onto a shirt and uses an earbud that can be retracted when someone is using it. You also need to consider their quality factor when picking out a headset. The Plantronics M214C, Samsung HM1300, and the Earbud Headset all have the feeling and behavior of products that have a lot of quality. None of these 3 is going to make you regret your decision to buy them. That being said the ReTrak isn’t as good as the best and the talking quality isn’t as good as the other ones available on the market. Because both the Plantronics M214C and the ReTrak have wires, charging is not needed to use these products and both may need adapters to use with minijacks. That being said, they will function with the batteries on a portable device. Also both the Samsung HM1300 and the Earbud Headset have rechargeable batteries inside them and connect with ease via Bluetooth tech. The price of the Plantronics M214C is only $15.99. The ReTrak is $9.99, and the Samsung HM1300 is $23.28. The most costly of these listed is the Earbud Headset that is priced at $37.99. The Plantronics M214C is fantastic for people who go their whole day chatting on the telephone and don’t have any mobility needs because of how bulky it is (even though it’s light) of the headset with the wires attaching it to the telephone. It is famous for having great sound quality and is perfect for people who want to use it a lot. That being said, the ReTrak has a bit more easy for mobile use, but you will still be attached with a wire to your telephone. Also, the spool to wind up the wire is often known to jam and get wound inside of the reel. The unit itself feels built very poorly and might make you frustrated. If you choose this it should be for using lightly. Also, you have to take your phone out of your pocket to receive calls, so this might not be a feature that will suit your needs. The Samsung HM1300 has the ability to use Bluetooth. The headset is easy to connect and will let you to connect two devices at the same time (like your business phone and personal phone). It also has a very long talking time and standby time so you won’t have to charge it as often. You will be able to use it for a whole day without worrying about charging it. It is an optimal headset for medium to large use. It has noise-canceling tech, but you are restricted to choosing from three gel tips that go around your ear to put on this product. For most people this won’t be an inconvenience and changing the tips to find the best fit is easily done. Last of all, the Earbud Headset is definitely the most comfortable of all the headsets and is very light. The battery will last the whole day without needing to be recharged. It is so light that you might even forget that you’re using it. It has a clip that lets you to wear it on your shirt or a bag so that your ear doesn’t get annoyed. 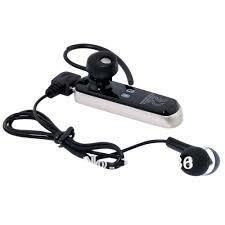 Using Bluetooth, it pairs with ease to your phone and the clearness when talking and listening is excellent. You can connect it with many products and it will even remind you with a sound if you forget to bring your phone along on your daily trips outside! It has controls that are easily controlled and the ability to talk on it all day with its long battery life. In all, except for the ReTrak that doesn’t perform well, all of these headsets have value to people who use them. The big difference between the Plantronics M214C and both the Samsung HM1300 and the Earbud Headset is that it needs to be connected with a wire and is a bit bulky. While both the Samsung HM1300 and the Earbud Headset don’t have wires, their big differences are the ear pieces and ear buds, and if the user wants to wear it rather than clip it to their shirt. The Plantronics M214C, Samsung HM1300, and Earbud Headset are all great choices for hands free phoning. When it comes down to it, most people want a wireless device and personal choice and cost will determine which features have most benefits for them.